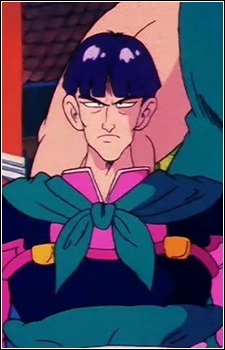 Sky Dragon is a martial arts teacher, and the leader of the Panther-Fang School along with his brother Rising Dragon. Sky Dragon is a very competitive fighter, training himself to not lose to any opposition. Sky Dragon also deals with his opponents in tactical maneuvers, using his greater intelligence to outwit his opponents in his fights, and once again using his great concentration to not slip up in his matches. Sky Dragon and his brother Rising Dragon were enemies with the Chin-star School, and had a grudge against Chin Taiken, wanting to defeat him. When Goku goes into town to get medicine for Master Chin, he ends up fighting Rising Dragon and winning, but then Sky Dragon beats Goku in a sneak attack. The next day, at King Wonton's Royal Match, Goku takes Master Chin's place, angering Sky Dragon. In their match, Sky Dragon spun at high speeds towards Goku, attacking him with his Panther-Cyclone technique. Sky Dragon has the upper hand for most of the fight, and the two use variations of the Afterimage Technique. It is this attack in midair that Goku uses to eventually defeat Sky Dragon, despite suffering from the effects of a laxative. Afterwards, Sky Dragon expresses respect towards Goku and befriends Master Chin's school. Years later, in the movie Dragon Ball Z: Bojack Unbound, Sky Dragon enters the Intergalactic World Tournament. He makes it to the final eight, but he is defeated by Doskoi in the Quarter Finals, being thrown out of the ring.